When was the last time you checked the alignment of your organization? For many, the answer is likely never! In fact, most probably don’t even know what true organizational alignment consists of. According to Webster’s alignment is an arrangement of groups or forces in relation to one another. In other words, is your organization in alignment with the Mission, Vision and long-range goals of the organization? Most would quickly say yes. But to be honest you really don’t know unless you check the alignment on a regular basis. Most organizations I’ve worked with assume that because the organization is making a profit and nothing has proverbially blown up that their alignment is just fine. As example, we worked with an organization that appeared to be doing great with their alignment. They were profitable and growing. But there was a problem festering under the surface of this wonderful organization. When we conducted the analysis and compared it against the organizations stated values, mission and vision we discovered a problem. There was at least one employee that was very unhappy. The stakeholders in the organization were surprised to find that there was a problem at all. The location was their most profitable and the person that was not happy was their best employee. The organization was out of alignment and it was beginning to spread throughout that location like a virus. Unattended, this could have been the undoing on this particular location. Analysis is the first step in identifying alignment issues. But how do we align the organization? This requires the delicate process of change management. Change management involves proper and effective communication, leadership coaching, and follower training among other things. In some cases, alignment requires a clear definition of what the organization is here for. Alignment takes time and patience. The process can’t be rushed and steps can’t be overlooked. Success comes from a proper alignment and is not always a do-it-yourself project. I know better than to try and do a front-end alignment on my car. I take it to a mechanic who has the tools and expertise to assist me. The same goes for organizational alignment. Don’t go it alone. Most organizations do not have the time or expertise to align their organization. If you’re in that place, we can help. Our team has over 60 years of leadership, management and organizational development experience. If you believe your organization could benefit from our 4-step process, please contact us today for a FREE consult. At the end of each year while many are setting New Year’s Resolutions I spend time thinking about much deeper issues. This past holiday break I began to think about organizations and the subject of change. My experience has been that many organizations want to change, but they just don’t know how. Some begin the process only to discover that they are ill equipped for the journey. 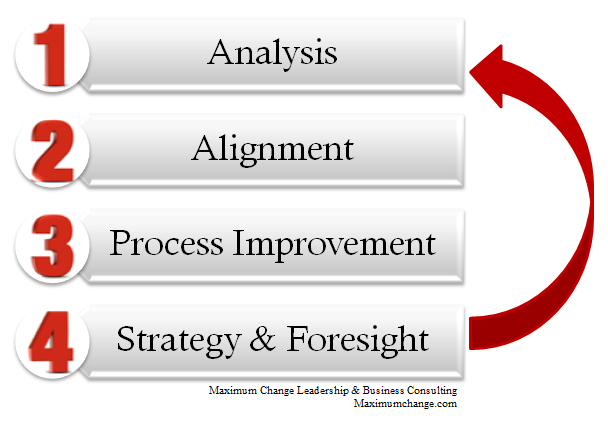 At Maximum Change we understand this problem and have developed a 4-step process for change. The first step is all about the analysis of the organization’s current state. We can’t change if we don’t know what it is we are changing to or from. Change for the sake of change is most always a waste of time. Most organizations take little time considering their culture, personalities, leadership, and structure and how they relate to the organizations vision, mission, or even the goals before them. Understanding the organization holistically means that we are better equipped to effect the changes needed. We utilize the process of interview, observation, assessment, training and coaching to develop a clear picture of the organizations current state. Our process considers the organization’s culture, leadership structure and individual personality profiles. This process illuminates the organization to its fullest, so that when we consider the desired changes we are better equipped to make those changes in the current organizational environment. Many organizations spend hours a year developing their yearly, three and five year plans only to abandon them to the shelves of their offices. Strategic planning is only the beginning of the process not the end. What we need to understand is that strategic planning is nothing more than forecasting based only on what we know. We call this lag-thinking. Lag-thinking is the process of making decisions based on what has already happened. Budgets and financial forecasts are typically based on this process of lag-thinking. Lag-thinking renders a plan useless within only a short period of time and must be updated constantly. Strategic plans based only on lag-thinking information are ill-equipped for the year ahead. If you believe your organization could benefit from our 4-step process, please contact us today for a FREE consult.